Sam Evison top scored for Bourne in the Winkworth Cup Final. Bourne’s fearsome reputation in Twenty/20 cricket continues to grow. Last night (June 22) they won the Winkworth Cup - the competition for the top clubs in Lincolnshire - and the first part of a possible 2017 T20 treble. Next week (June 28) they seek to retain the Jaidka Cup with victory over Peterborough Town at Bretton Gate in the final and the following Monday (July 3) they will take part in the Stamford KO Shield final against either Ketton or King’s Keys. Bourne won at a canter in the delayed Winkworth Final against Woodhall Spa at Sleaford CC. They passed Woodhall’s miserable 117-7 in with almost half of their allotted overs remaining. 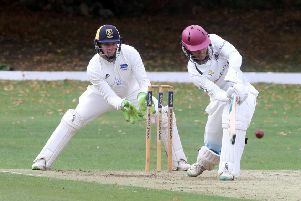 Sam Evison, who made his Lincolnshire Minor Counties debut at the weekend, was 41 not out when victory was completed, while Jack Berry and skipper Pete Morgan made 36 apiece. Bourne have now won the Winkworth three times in the last five years. Ketton and King’s Keys have provisionally arranged to play their Stamford KO Shield semi-final at Pit Lane next Wednesday (June 28). Bourne 118-1 (S. Evison 41no, J. Berry 36no, P. Morgan 36) beat Woodhall Spa 117-7 (B. Stroud 2-13, J. Berry 2-28) by 9 wkts.